AntwerpPhoto is held at a unique location on the bank of the river Scheldt in Antwerp. The Loodswezen building (Piloting building) on the Tavernierkaai is located in the lively neighborhood of Het Eilandje, close to the MAS museum and the city center. The eclectic neo-Renaissance palace was designed by Hendrik Kennes and Ferdinand J.A. Truyman in 1890. Until recently it was used as the base for Antwerp’s pilots, who guide ships safely and smoothly in and out of Antwerp’s port. 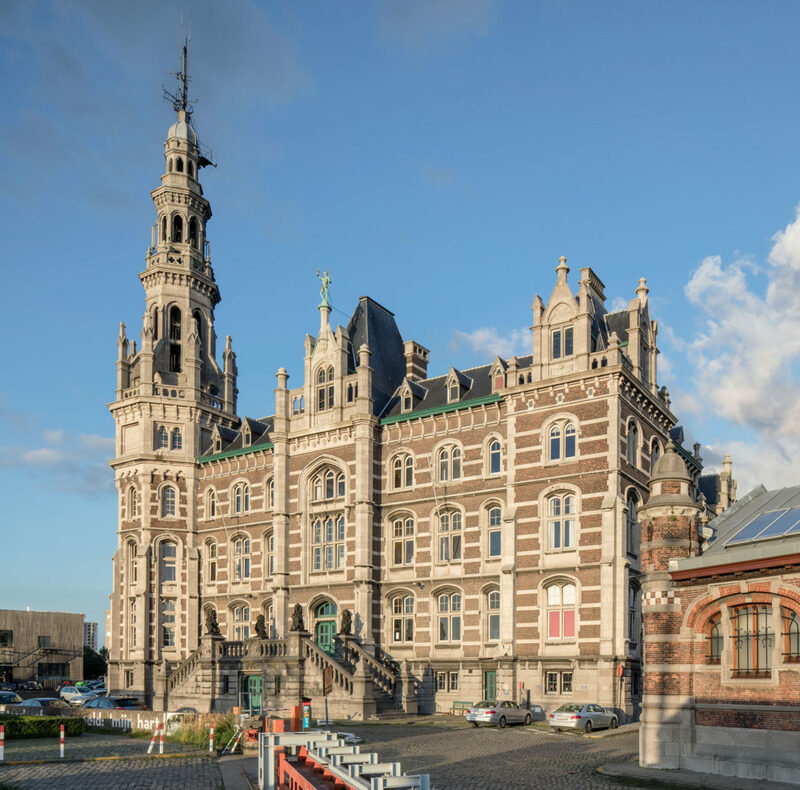 The historic Loodswezen building is being opened to the public for the first time and can be visited exclusively during AntwerpPhoto. The ornate watchtower, the courtyard and the statue of Brabo on the facade are just a few striking features of this building. Groups: to receive your discount code, please let us know the number of people in your group via email. Guides: Interested in a guided visit? Guided tours are available for €105 for 1,5 hours. Make your reservation in advance via email. AntwerpPhoto is a cashless festival, you can pay by card only. Children under the age of 7 enter for free. The four ongoing exhibitions (1-2-3-4, Michael Wolf, Iconobelge and Prix Carmignac) are open to the public from June 24 until September 30 2018. The ticket desk closes at 17.30. On Wednesday August 15 AntwerpPhoto will be open continuously from 10 AM to 9 PM. Coming to Antwerp by train? With a B-Dagtrip ticket you can purchase your train and tram tickets as well as your entrance ticket, at a discount rate. AntwerpPhoto can be easily reached by public transport. From Antwerp Central Station you can take the underground tram right under the station (Premetrostation Diamant): take tramlines 9 or 15 (in the direction P+R Linkeroever) for one stop (Meir). Transfer to tramline 7: the above ground stop (Antwerpen Meirbrug) is just a 100m walk. Get off at Antwerpen Brouwersvliet, right in front of the location. More information on the public transportation website De Lijn. You can reach AntwerpPhoto by bike in less than 10 minutes from the city center. There are several city bike or ‘Velo’ stations nearby. The nearest one is right across from the Loodswezen building, on the Sint-Aldegondiskaai. More information on Velo-antwerpen.be. Coming by car? You can park your car on the Van Meterenkaai. There are also several underground parkings nearby: on Sint-Pietersvliet and on the Godefriduskaai (entrance: Zeevaartstraat 11). Be sure to check Slim naar Antwerpen for traffic updates. Staying in Antwerp? Get a 10% discount on your booking at the Holiday Inn Express Antwerp City - North by mentioning 'AntwerpPhoto' when making your reservation via email. Backpacks are not permitted in the exhibition areas. Please take into account that the festival takes place in a listed and protected monument which has many staircases and does not have a working elevator, and that the exhibitions are spread out over several floors. Given the specific characteristics of the building, the exhibitions of the Belgian photographers, the exhibition of the laureates of the Prix Carmignac and the exhibition of photographer Michael Wolf, which all take place on higher floors of the building, unfortunately are only accessible using one or more staircases and are, thus, not accessible for wheelchairs. The works displayed in these exhibitions, as well as impressions of the exhibitions, can be viewed digitally on the ground floor. However, the Anton Corbijn exhibition is accessible via a different entrance, without using a staircase. Should you want to utilize this option, we kindly ask you to contact our staff via info@antwerpphoto.be, so that we can ensure access to the building using said entrance at the time of your visit. €12,50 (including € 1,5 transaction fee) if you buy your ticket via the website; and €14 if you pay your ticket at the door. The companion of the disabled person enters the exhibition for free.